“Being on Idol was an invaluable experience,” says James Durbin, who took the #4 slot on the 2010 edition of American Idol, “I wouldn’t trade it for the world. But I am really excited to do my own thing and show people my range. I was ready to rock on this record and couldn't be more proud of the results." Not false bravado when you consider the source. At 22 years of age, Durbin has already made his mark on the Idol stage. Now, with Memories of a Beautiful Disaster due November 21 on Wind Up Records, he’s ready to prove he is the real deal. So strong is the belief in Durbin, who is managed by 19 Entertainment, that two different tracks are being released to radio at the same time. The anthemic rocker “Stand Up,” which will also featured in various NFL promotions throughout the Fall, will be released to Rock Radio and “Love Me Bad” will go to Top 40 radio. 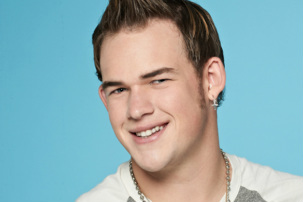 Memories of a Beautiful Disaster is where James Durbin confirms what all of those who voted for him week after week on Idol already knew –he is a rock star on the rise!